SLATER might only be three years old, but he's strong, happy and has a great attitude to overcome any challenge thrown his way. That's how Emily Krapkat describes her little boy, who battles slow 1p36 deletion syndrome which has slowed his mental and physical development. 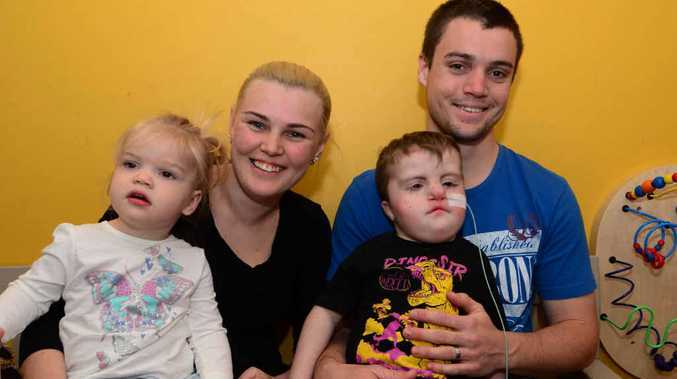 His condition means that he has regular visits to his doctor and specialist in Brisbane, but Emily tries to make sure he has just as much fun as any other little boy, and says he's at his happiest around animals. "We're hoping one day to have our own property with horses, I want to be able to always take the kids riding," she said. The family are a step closer to that dream after Lazy Acres owner Larry Barron donated a pony to Slater. Emily was blown away when she heard the good news. "I couldn't believe that someone was so generous to give my son a pony," she said.